The November issue of Civil War News contains a really outstanding review of my Rush’s Lancers: The Sixth Pennsylvania Cavalry in the Civil War. I’m not normally one to blow my own horn–I actually find it unseemly–but this review is so good that I wanted to share it. As book reviews go, it doesn’t get much better than this. Illustrated, notes, index, appendix, 304 pp, 2007. Westholme Publishing LLC, 8 Harvey Ave., Yardley, PA, 19067, $29.95 plus shipping. Chuck Romig graduated from Penn State University with a B.S. in secondary education and teaches history at Penns Valley High School in Spring Mills, Pa. He continues to read and research Civil War history. Eric J. Wittenberg has produced a gem of a regimental in Rush’s Lancers: The Sixth Pennsylvania Cavalry in the Civil War. Probably every Civil War buff can name one or two favorite John Wayne films and I’d be willing to bet that in at least one of those films the Duke was in the cavalry. Wittenberg, in this work, expertly reveals not only untold morsels about one of the Civil War’s famed cavalry units, but also the experience of a horse soldier in the war. He begins the story with the formation of the regiment in Philadelphia, Pa., spearheaded by one Richard H. Rush, a descendant of Dr. Benjamin Rush of Philadelphia renown. Rush was a member of the West Point class of 1846 but failed to live up to the reputation for which that class was known. After a hiatus from the military Rush had problems gaining a commission in 1861. He used his family’s name to eventually gain rank. The 6th Pennsylvania initially mustered at Camp Meigs in the City of Brotherly Love where they actually trained with lances, a fad that Gen. George McClellan had advocated since his Crimean trip. After the endless drilling common to any volunteer regiment of the Civil War, the 6th Pennsylvania was ordered to join the Army of the Potomac at Manassas. On their way to the Peninsula to take part in that debacle, they sat as peaceful spectators and viewed the battle of Hampton Roads where the U.S.S. Monitor and the C.S.S. Virginia dueled to a draw in mid-March 1862. Wittenberg uses his subjects to tell their story with deftness and accuracy. Pulling from a slew of privates, officers and a chaplain, he allows the men of the 6th Pennsylvania and those who interacted with them to tell their tale posthumously. This style picks up once the men are on the Peninsula and continues through the Maryland Campaign of 1862, Fredericksburg, Stoneman’s Raid and Chancellorsville, Brandy Station, Gettysburg, the transition of Grant to the East, and the 1864 Valley Campaign. Wittenberg’s work is filled with points of human interest, as well as strategic and tactical analysis, which make this regimental a more exciting read than many others. But it is not just the human interest and military analysis that make this book a keeper. It’s the group of troopers that Wittenberg chose as subjects. I’m sure that stories as good as the 6th Pennsylvania’s exist, but there are none better. Taste these tidbits to understand what I mean. Why was Stonewall Jackson late in arriving on the Peninsula from the Valley? The 6th Pennsylvania. 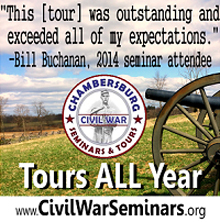 Which was the only unit to get a shot off at Stuart’s troopers in their first ride around the Army of the Potomac? The 6th Pennsylvania. Who led brave charges into the teeth of hell at Brandy Station and South Cavalry Field at Gettysburg? The 6th Pennsylvania. Theirs is a story that needed to be told. Frankly, I’m shocked it took this long with all the Civil War literature published these days. Wittenberg matches fantastic subjects with an appropriate style of drawing from firsthand accounts in Rush’s Lancers. I wish more photographs would have accompanied the text, however, Wittenberg may have used all that were available. This one’s a good one. Thanks, Mr. Romig. I’m humbled by your kind words for what was very much a labor of love for me. You’re quite correct in that I had an extraordinary set of subjects to work with here, all of which made the historian’s job that much easier. The eloquence of these men extended from the regimental colonel on down to lowly sergeants, all of which made documenting their exploits simpler. I’m not quite done with the Lancers yet. I have one more project yet to go…..
And, to answer your one very mild complaint, I used EVERY photograph of a member of the Lancers that I could find. If I had managed to find more, they would have made their way into the book. There was only one photo that I did not use, of the very last reunion of the regiment, as it was a scan of a photocopy of an old newspaper, and it just didn’t duplicate well enough to run. As it was, many of those photos appear in the book for the first time anywhere. Help in preserving important Civil War sites in the Fredericksburg area has come from many quarters, including developers. The Silver Cos. recently completed its second donation of land at Grant’s Knoll, across from Ellwood in Orange County, according to the Central Virginia Battlefields Trust. The land, deeded to the preservation group, is considered the gateway to the Wilderness Battlefield. Silver, the Fredericksburg area’s largest commercial development firm, donated about 12 acres. That comes on the heels of a donation of about 6 acres near the intersection of State Routes 3 and 20 in 2001. According to CVBT Secretary Erik Nelson, the donated ground is where Union Lt. Gen. Ulysses S. Grant made his headquarters during his first confrontation with Confederate Gen. Robert E. Lee in 1864. Over the two-day battle, the Confederates turned both flanks of the Union army and fought to a standstill along Orange Plank Road. In September, CVBT Executive Director Linda Wandres noted the importance of the donation in a statement to the Virginia Sesquicentennial of the Civil War Commission. “It is indisputable that the actions of preservation-minded people over the next five years will determine the fate of the remaining Civil War battlefields in Virginia,” she said. Preservation of important Civil War parcels outside National Park Service battlefield boundaries is an urgent focus of CVBT at a time when sprawl is gobbling up what little land remains. CVBT President Mike Stevens said the Grant’s Knoll land will now be protected in perpetuity, and he praised the Silver Cos.
Grant’s Knoll’s historical connections go way back. “This is also the area where Lafayette camped” before the Battle of Yorktown in the Revolutionary War, Nelson said. Given the contentious fight to try to preserve a portion of the Mullins Farm at Chancellorsville, it’s really nice to see a developer and a very successful preservation group work together to accomplish a terrific result. Kudos to both the Silver Cos. and the Central Virginia Battlefield Trust for another lesson in how to do it right. El Dorado Hills, CA October 10, 2007 — Historical book publisher Savas Beatie LLC and The Civil War Preservation Trust have teamed up to raise money for endangered Civil War battlefields. Savas Beatie is a leading independent publisher of military and general history books. Many of its titles focus on specific battles and campaigns, and so have been used by various groups and individuals to raise funds for various preservation causes. The Civil War Preservation Trust (CWPT) is America’s largest non-profit organization (501-C3) devoted to the preservation of our nation’s endangered Civil War battlefields. The Trust also promotes educational programs and heritage tourism initiatives to inform the public of the war’s history and the fundamental conflicts that sparked it. Recently, CWPT picked up two special editions of Savas Beatie titles – Champion Hill: Decisive Battle for Vicksburg, by Timothy Smith, and Chicago’s Battery Boys: The Chicago Mercantile Battery in the Civil War’s Western Theater, by Richard Brady Williams—as premiums to help raise money for newly-acquired property on the Champion Hill battlefield. When customers purchase any Savas Beatie book(s) from the company’s website (www.savasbeatie.com), they can include the coupon code “CWPT” with their order. Whenever an order is placed with this designation, Savas Beatie will donate 10% of the purchase price of the order to The Civil War Preservation Trust. David Duncan, Director of Membership and Development for CWPT agrees. “The Civil War Preservation Trust is thrilled to be working with Savas Beatie, the company that has been responsible for such tremendous Civil War scholarship—and other history—for so many years,” Duncan says. For additional information on the Savas Beatie-CWPT donation arrangement, contact Sarah Keeney or visit www.savasbeatie.com. The predecessor to Ironclad Publishing was called VanBerg Publishing. Unfortunately, VanBerg didn’t make it for a variety of reasons, not the least of which was that I ended up having a pretty major falling out with my former business partner from VanBerg. However, one of the cornerstones of our business plan for VanBerg was the donation of 10% of our gross proceeds to battlefield preservation. It was a way for us to give something back while also giving us a great marketing tool. Ted’s now picked up the cudgel and is carrying on with the same concept. Best wishes to Ted for stepping up to the plate and putting his money where his mouth is. I wanted to give a quick thumbs up to a group doing some underappreciated but much needed preservation work, the Hunterstown Preservation Society. The good folks from the HPS face a severe challenge: they are fighting a developer that does not care about the fact that he intends to eradicate a nearly pristine battlefield in the process. Please give these folks your support, both financially and morally, as they need all of the help that they can get to save their beautiful little battlefield. J. D. had a good post about the efforts of the HPS on his blog today, which I commend to you. My old friend and mentor Clark B. “Bud” Hall, one of the founders of the Civil War preservation movement, was one of the speakers at the dedication of the faithful cavalry horse in Middleburg, Virginia. Bud has a home in Middleburg, and he is one of the leading authorities on Civil War cavalry operations, so it was entirely appropriate for him to speak at the dedication of the monument ten years ago. Bud was kind enough to share with me his comments that day, and I find them so moving that I want to share them with you. Here they are: an appropriate tribute to the cavalry horses who sacrificed so much during the Civil War. But through it there rolls not the breath of its pride. Ah! The horses—the blacks and bays, the roans and grays, the sorrels and chestnuts that pulled Lee’s army from the Rappahannock to Gettysburg and back, and all the other horses that pulled and tugged at the wagons, at the batteries of artillery; the horses that carried the men, the unstabled horses and the half-fed horses. Let my right hand forget its cunning if I forget to pay proper tribute to those noble animals that suffered so much for their masters. How often my mind goes back to that horse my mind’s eye saw coming across the field from the front at Bull Run with his sides all dripping with blood. He was a hero and coming back home to die. The cavalryman and his horse got very close to each other, not only physically, but also heart to heart. They ate together, slept together, marched, fought and often died together. While the rider slept, the horse cropped the grass around him and got as close up to his rider’s body as he could get. The loyal steed pushed the trooper’s head gently aside with his nose to get at the grass beneath it. By the thousands, men reposed in fields fast asleep from arduous campaigns with their horses quietly grazing beside them, and nary a cavalier was trod upon or injured by his steed. They were so faithful and unfaltering. When the bugle sounded, they were always ready to respond, for they knew all the bugle calls. If it were saddle up, or the feed, or the water call, they were as ready to answer one as the other. And they were so noble and so brave in battle. They seemed to love the sound of the guns. The cavalryman might lie low on the neck of his horse as the missiles of death hissed about him. But the horse never flinched, except when struck. Lo! As we should, we build monuments for our dead soldiers, for those we know, and for the unknown dead. So with the ultimate sacrifice of our lamented fallen honored upon their noble deaths, is it not also just that we recall their valiant steeds? What would you think of a monument some day, somewhere in Virginia, in honor of Lee’s noble horses? What could General Lee have done had all his horses balked in unison? Nothing! Then all honor to Lee’s horses, which pulled and hauled and fought and died that this might be a very great nation. ‘All? O, God! It is all I can speak. With eternal thanks (and apologies) to Trooper George Baylor, his poignant lines have been somewhat revised. Well said, Bud. Well said. Centex Homes of Texas gets kudos for its willingness to work with local preservation groups so as to save a battlefield but still get to develop the land surrounding the battlefield. In an unprecedented partnership that should serve as the template for all such efforts, Centex agreed to carve out the Bristoe Station battlefield site in Virginia, and the preservationists agreed not to dispute Centex’s development of the neighboring parcels. It was, as the movie Casablanca ended, the making of a beautiful friendship. I wish that the idiot trying to develop the Hunterstown battlefield would learn something from this example. Tucked behind rows of new single-family homes and town houses are approximately 134 historic acres now open to the public as Bristoe Station Battlefield Heritage Park in Bristow. Historians and residents celebrated the park’s grand opening this weekend with tactical demonstrations, tours and living history exhibits. Park visitors got to see what a Civil War field hospital would have looked like, complete with a field surgical chest, various medical tonics, a body cleaning area and other items. Washington, D.C., podiatrist and living history demonstrator Dr. Charles Raugh said the replica hospital camp on display Sunday was positioned as a front line hospital in the center of the battlefield during the war. Raugh said Civil War field hospitals typically consisted of two surgeons, two tables and “hordes of wounded” in the front. Historical re-enactor James Owens of Silver Spring, Md., and his fellow members of Company D 1st Minnesota Volunteer Infantry demonstrated various Union Army formations for visitors Sunday. As the 1st Minnesota re-enactors demonstrated “capping off,” or clearing their muskets before battle, Owens explained that the first thing soldiers learned when they enlisted during the Civil War was the school of the soldiers. The school served as uniform rules about formation and techniques for battle. Owens explained how the troops were formed into two lines of battle with officers at the back. As casualties occurred, the gaps would be filled by other soldiers, he said. During the skirmish demonstration, Owens explained that the main idea behind the formation of firing in pairs was to keep the loaded musket closest to the opponents. After one soldier fired, another would move up to cover him, Owens said. Sunday marked the 144th anniversary of the Battle of Bristoe Station. On Oct. 14, 1863, Confederate Lt. Gen. A.P. Hill’s corps stumbled upon two corps of the retreating Union army at Bristoe Station and attacked without proper reconnaissance. Union soldiers of the 2nd Corps, posted behind the Orange and Alexandria Railroad embankment, mauled two brigades of Henry Heth’s division and captured a battery of artillery. Hill reinforced his line but could make little headway against the determined defenders. After this victory, the Federals continued their withdrawal to Centreville. 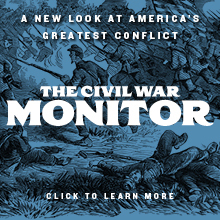 Confederate Gen. Robert E. Lee’s Bristoe offensive sputtered to a premature halt. After minor skirmishing near Manassas and Centreville, the Confederates retired slowly to Rappahannock River destroying the Orange and Alexandria Railroad as they went. Bristoe Station Battlefield Heritage Park is located off Bristow Road (Va. 619 West) near the intersection of Va. 619 and Va. 28 South. For more information, call 703-257-5243. As I said, this should be the formula for all such efforts. This is how to do it right. In August, I posted about the better features of Google’s book search feature. J. D. and I both made very extensive use of Google’s site, as well as the Microsoft live book search site (a note about the Microsoft site–it will not work on the Mac. That, in and of itself, is reason enough for me not to want to use it at all). Libraries that agree to work with Google must agree to a set of terms, which include making the material unavailable to other commercial search services. Microsoft places a similar restriction on the books it converts to electronic form. The Open Content Alliance, by contrast, is making the material available to any search service. Google pays to scan the books and does not directly profit from the resulting Web pages, although the books make its search engine more useful and more valuable. The libraries can have their books scanned again by another company or organization for dissemination more broadly. It costs the Open Content Alliance as much as $30 to scan each book, a cost shared by the group’s members and benefactors, so there are obvious financial benefits to libraries of Google’s wide-ranging offer, started in 2004. Many prominent libraries have accepted Google’s offer — including the New York Public Library and libraries at the University of Michigan, Harvard, Stanford and Oxford. Google expects to scan 15 million books from those collections over the next decade. But the resistance from some libraries, like the Boston Public Library and the Smithsonian Institution, suggests that many in the academic and nonprofit world are intent on pursuing a vision of the Web as a global repository of knowledge that is free of business interests or restrictions. Even though Google’s program could make millions of books available to hundreds of millions of Internet users for the first time, some libraries and researchers worry that if any one company comes to dominate the digital conversion of these works, it could exploit that dominance for commercial gain. Last month, the Boston Library Consortium of 19 research and academic libraries in New England that includes the University of Connecticut and the University of Massachusetts, said it would work with the Open Content Alliance to begin digitizing the books among the libraries’ 34 million volumes whose copyright had expired. “We understand the commercial value of what Google is doing, but we want to be able to distribute materials in a way where everyone benefits from it,” said Bernard A. Margolis, president of the Boston Public Library, which has in its collection roughly 3,700 volumes from the personal library of John Adams. Mr. Margolis said his library had spoken with both Google and Microsoft, and had not shut the door entirely on the idea of working with them. And several libraries are working with both Google and the Open Content Alliance. Adam Smith, project management director of Google Book Search, noted that the company’s deals with libraries were not exclusive. “We’re excited that the O.C.A. has signed more libraries, and we hope they sign many more,” Mr. Smith said. The Library of Congress has a pilot program with Google to digitize some books. But in January, it announced a project with a more inclusive approach. With $2 million from the Alfred P. Sloan Foundation, the library’s first mass digitization effort will make 136,000 books accessible to any search engine through the Open Content Alliance. The library declined to comment on its future digitization plans. The Open Content Alliance is the brainchild of Brewster Kahle, the founder and director of the Internet Archive, which was created in 1996 with the aim of preserving copies of Web sites and other material. The group includes more than 80 libraries and research institutions, including the Smithsonian Institution. Although Google is making public-domain books readily available to individuals who wish to download them, Mr. Kahle and others worry about the possible implications of having one company store and distribute so much public-domain content. “Scanning the great libraries is a wonderful idea, but if only one corporation controls access to this digital collection, we’ll have handed too much control to a private entity,” Mr. Kahle said. Mr. Kahle’s group focuses on out-of-copyright books, mostly those published in 1922 or earlier. Google scans copyrighted works as well, but it does not allow users to read the full text of those books online, and it allows publishers to opt out of the program. Microsoft joined the Open Content Alliance at its start in 2005, as did Yahoo, which also has a book search project. Google also spoke with Mr. Kahle about joining the group, but they did not reach an agreement. A year after joining, Microsoft added a restriction that prohibits a book it has digitized from being included in commercial search engines other than Microsoft’s. “Unlike Google, there are no restrictions on the distribution of these copies for academic purposes across institutions,” said Jay Girotto, group program manager for Live Book Search from Microsoft. Institutions working with Microsoft, he said, include the University of California and the New York Public Library. The University of Michigan, a Google partner since 2004, does not seem to share this view. “We have not felt particularly restricted by our agreement with Google,” said Jack Bernard, a lawyer at the university. The University of California, which started scanning books with the Open Content Alliance, Microsoft and Yahoo in 2005, has added Google. Robin Chandler, director of data acquisitions at the University of California’s digital library project, said working with everyone helps increase the volume of the scanning. Some have found Google to be inflexible in its terms. Tom Garnett, director of the Biodiversity Heritage Library, a group of 10 prominent natural history and botanical libraries that have agreed to digitize their collections, said he had had discussions with various people at both Google and Microsoft. “Google had a very restrictive agreement, and in all our discussions they were unwilling to yield,” he said. Among the terms was a requirement that libraries put their own technology in place to block commercial search services other than Google, he said. Libraries that sign with the Open Content Alliance are obligated to pay the cost of scanning the books. Several have received grants from organizations like the Sloan Foundation. The Boston Library Consortium’s project is self-funded, with $845,000 for the next two years. The consortium pays 10 cents a page to the Internet Archive, which has installed 10 scanners at the Boston Public Library. Other members include the Massachusetts Institute of Technology and Brown University. The scans are stored at the Internet Archive in San Francisco and are available through its Web site. Search companies including Google are free to point users to the material. On Wednesday the Internet Archive announced, together with the Boston Public Library and the library of the Marine Biological Laboratory and Woods Hole Oceanographic Institution, that it would start scanning out-of-print but in-copyright works to be distributed through a digital interlibrary loan system. The Internet Archive Project’s system is far superior to that of either Google or Microsoft because it’s the only truly open one available to the world. And it’s why I prefer to use its resources whenever possible. 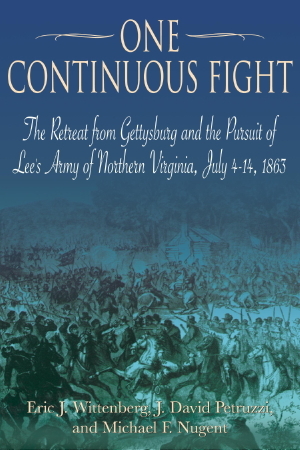 Here is the cover art for our book on the retreat from Gettysburg. The scene portrayed in the vintage woodcut is the July 8, 1863 Battle of Boonsboro. The cover art was done by the same graphic designer that did the cover art for the Stuart’s Ride book. The idea was to make the dust jacket for the retreat book be consistent with the Stuart’s Ride book, a la Gordon Rhea’s books on the Overland Campaign. It only makes me more eager to see the final product when the book is published. There will be 16 maps, and something like 50 illustrations. Given the word count, Ted Savas tells me that we’re looking at a book in the range of 550 pages in length. That will be my longest book, by a long shot. Both of the driving tours include complete GPS coordinates, meaning that it will be VERY difficult for anyone following them to get lost. There already seems to be some buzz building about this book. It’s a shame we have to wait for next June for it to come out…..
Time for another in my infrequent series of forgotten cavalrymen. 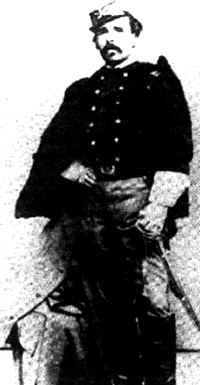 Born to an ancient, ennobled Italian family in 1833, Luigi Palma di Cesnola had a glittering military reputation at the beginning of the Civil War. His father had fought for Napoleon. di Cesnola was educated at the Royal Military Academy at Turin, and entered the mounted arm of the Sardinian army. At age seventeen, the young count fought against powerful Austrian armies in Italy’s war for independence. He also fought in the Crimea in the late 1850’s. Finally, in 1860, di Cesnola immigrated to the United States, settling in New York. He married the daughter of an American naval officer and served as the director of a 700-student military school in New York. With the coming of war, he offered his services to the 11th New York Infantry, and received a commission as major as a result of his prior military service. 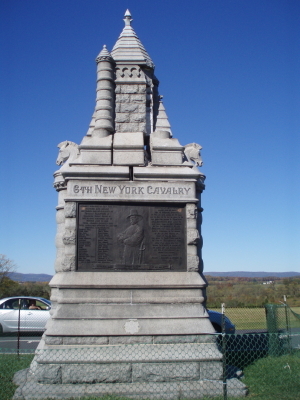 He was promoted to lieutenant colonel in 1862, before accepting an appointment as colonel of the 4th New York Cavalry. However, in February 1863, the dashing count was dismissed from the service for allegedly stealing six pistols, but he was exonerated, reinstated, and returned to his regiment. At the time, di Cesnola commanded a brigade of cavalry as well as a detachment of infantry and a battery of artillery. The unhappy colonel protested, and the Judge Advocate General’s office launched an investigation. It found that di Cesnola “was most unjustly wronged,” and he was reinstated to his former rank and position. di Cesnola wrote to his division commander, Brig. Gen. William W. Averell, asking “In regard to my former position I heard that my brigade has been broken up & my Regt is under your command now; though I regret my command has gone yet it is gratifying to me to be under the command of a regular officer like you are.” Averell returned di Cesnola to command of the 4th New York Cavalry, and the dashing Italian count proved himself a brave man in the coming months. Although the injustice was corrected, this incident cut di Cesnola to the quick. “With what aching heart I return to my regiment few persons can appreciate it,” he wrote to his Congressman a week later. “I tried ever to my utmost in well deserving from my adoptive country and the rewards I received from the Administration I may say were nothing but kicks.” He concluded, “I am…going to the Regiment with a broken heart to stay there some weeks and then I shall resign as it is incompatible with my character to continue.” The dashing count did not resign, and remained with his regiment, which had a troubled history for the duration of its service with the Army of the Potomac. Incredibly, the proud count’s humiliation grew. In the aftermath of the June 9, 1863 Battle of Brandy Station, Brig. Gen. Alfred Pleasonton, now commanding the Cavalry Corps, placed di Cesnola under arrest for moving some of his men through an infantry camp while on the way to the front. At the June 17, 1863 Battle of Aldie, di Cesnola led his men into battle without any weapons, and in spite of the fact that his arrest meant that he had no command authority. As a result of di Cesnola’s valiant conduct, Col. Judson Kilpatrick, di Cesnola’s brigade commander, asked Pleasonton to release the count from arrest, and Pleasonton agreed. Di Cesnola was awarded the Medal of Honor for his valor that day, something that undoubtedly rankled Pleasonton a great deal. However, the count also suffered serious combat wounds and was captured and sent to Richmond’s notorious Libby Prison, meaning that he, too, did not command troops in the Army of the Potomac for nearly a year. di Cesnola had a fascinating career after the Civil War. 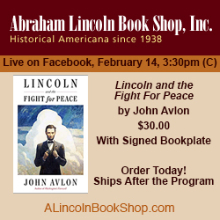 At the end of the war, he published an account of his time as a prisoner of war in Libby Prison. In 1865, di Cesnola, now a naturalized American citizen, was appointed consul general to Lanarca, Cyprus, while the island was occupied by the Ottoman Empire. He remained there until 1876, illegally acquiring a large collection of antiquities taken from Cypriot tombs that he removed to the United States. He wrote a well-regarded book about his excavations and archaeological studies of the island, and his vast collection of nearly 5,000 items is on display in Harvard University’s Semitic Museum. He also wrote a lengthy description of the collection when it was placed on display. The count sold his collection to the new Metropolitan Museum in New York, and then became the museum’s first director in 1879, a position that he held until his death on November 21, 1904, at the age of seventy-two. di Cesnola’s excavations remain an unhappy chapter in the history of Cyprus, which still views the collection as property of the State of Cyprus. He was buried in Kensico Cemetery in Valhalla, West Chester County, New York. More than one hundred years after his death, Cypriots often view the Italian count as a grave robber.